This was one of those lunchtime accidents. It’s going to happen again, but the next time it won’t be an accident. I was scrounging through the fridge for something for lunch, and I’m a little shy on leftovers right now. There were some corn tortillas I made the other day, and some leftover roasted Poblano peppers. I made a batch of queso fresco this morning, but it was still sitting in the mold under a weight. 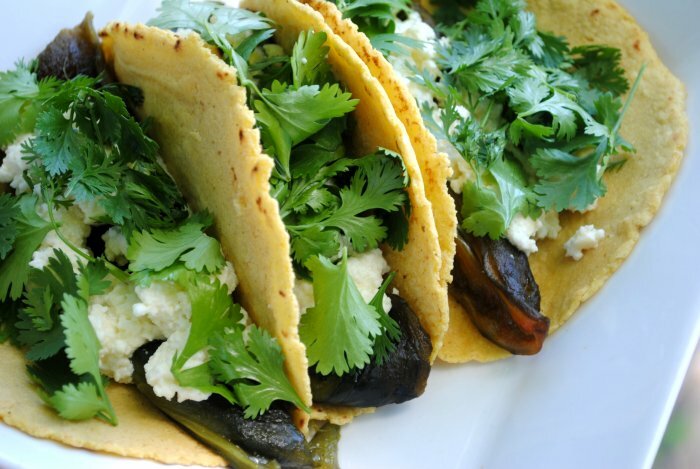 I got into it anyway, and it crumbled, which was perfect for these impromptu tacos. A generous bunch of cilantro, and a squeeze of fresh lime, and I had lunch! 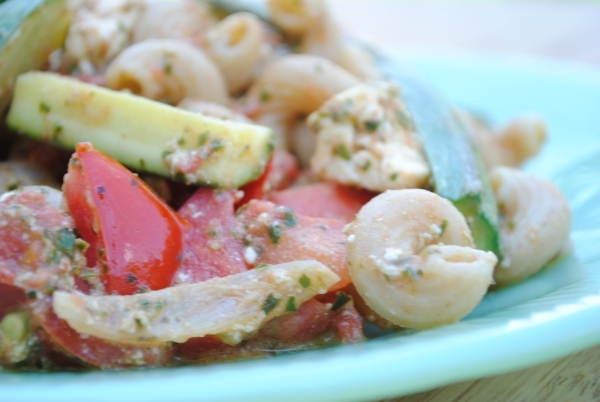 It’s amazing what you can do with leftovers! I just had to share, and now I’ve got to go back to work. Have you missed me? Nope, probably not, but I won’t hold it against you! I took some time off work so my mom and I could go visit my sister in southern Indiana, and visit a few places I’ve been intending to visit for the last few years. Owning a family run business, if the family wants to do anything together, I have to close up shop entirely to make it possible. I’m going to break this into two parts, and try not to get too detailed … just general impressions. My mom and I arrived at my sister’s house in the late afternoon. This is the first time I’ve visited my sister since she and her family moved back to the states from Germany, so I got the grand tour of her new home. As soon as my brother-in-law got home from work we headed out to the New Albanian Brewery for some of the best pizza in southern Indiana, and of course, beer! I had their Keller Pils, a German style pilsner, with my meal. The place wasn’t busy, and our waitress was excellent. We had asked her several questions about some of the beers, and I think she realized she a couple of beer geeks on her hands. Without asking us (and free of charge), she brought out a tasting flight of 6 for my brother-in-law and I to try. Guess who earned a really big fat tip? I was so focused on food and beer that I forgot to grab my camera on my way out the door. I plan to make this a regular stop whenever I visit my sister, so I’ll have plenty of opportunities to snap some shots. Of course I had to buy some beer for friends since this brewery doesn’t bottle for distribution. The next morning we headed out to visit Stream Cliff Herb Farm & Winery. I enjoyed the visit, but it had its pros and cons. We stopped in the wine tasting room first to sample a few wines. These three vintages found their way home with me. Prancing horse is a sweet cranberry wine which I plan to use in a mulled wine recipe at Christmas time. Horsefeathers is a crisp, dry Sauvignon blanc which will probably be the bottle that sits on my counter (and disappears) the next time I make risotto. 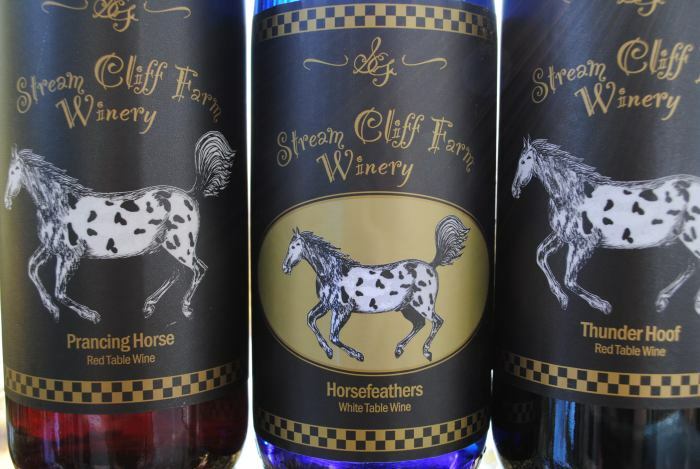 Thunder Hoof is a dry Shiraz, ripe and rich on the palate with plum and wood. I might go back for more of that Shiraz some day. 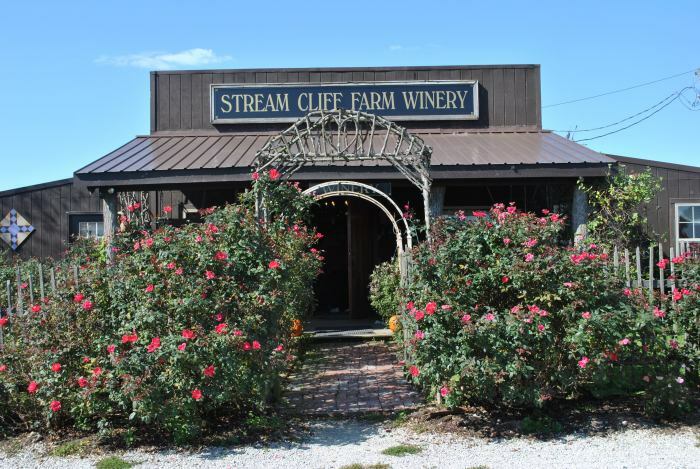 Stream Cliff calls itself historic, and boasts to be Indiana’s oldest herb farm. I found myself very disappointed with the herb gardens. I went expecting to be presented with culinary, medicinal, tea, and dyer’s herbs. What I got were several pretty ornamental perennial gardens laid out in quilt patterns with herbs thrown in here an there. I consider myself a folk herbalist, and I approach herbs as useful plants for food, medicine, and comfort. I expected a historic farm to present me with gardens that would exemplify herbal traditions. The Twigs & Sprigs Tearoom was a wonderful place to have lunch with my mom and sister. It definitely had a feminine appeal, and we didn’t see many men in attendance. We had our lunch outside on the covered porch where all the tables were covered with different linens that could have passed for vintage patterns. The food was outstanding and well seasoned with herbs. 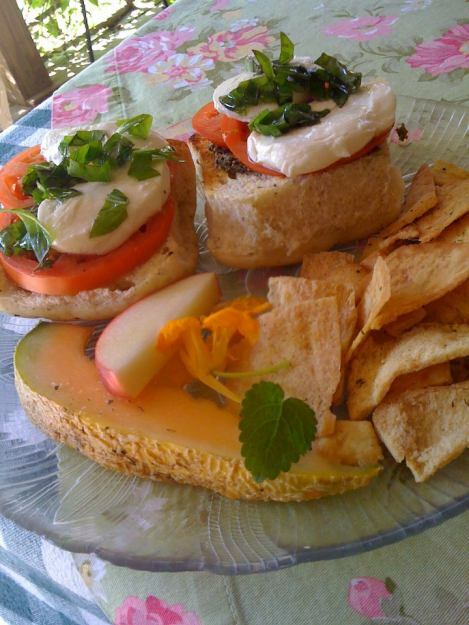 I had a lemon verbena lemonade, and an open-faced sandwich made with focaccia spread with pesto, topped with fresh mozzarella, tomato, basil, and liberally drizzled with olive oil. When I go back for that Shiraz, I’ll eat lunch again, but skip the herb gardens. The following day we visited Capriole Goat Farm. I’ve been wanting to try their cheese for many years, and knew they were located in southern Indiana. The big surprise was discovering the farm was only 3 miles from my sister’s house. I would have liked to take pictures in the dairy, but when I asked if I could take a few shots, I was asked not to do so. 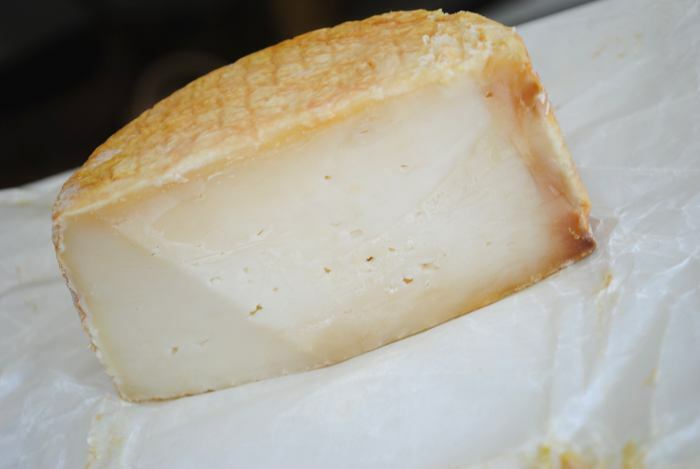 The dairy’s cheeses are highly awarded and world-renowned. They have trade secrets they are very careful to protect. 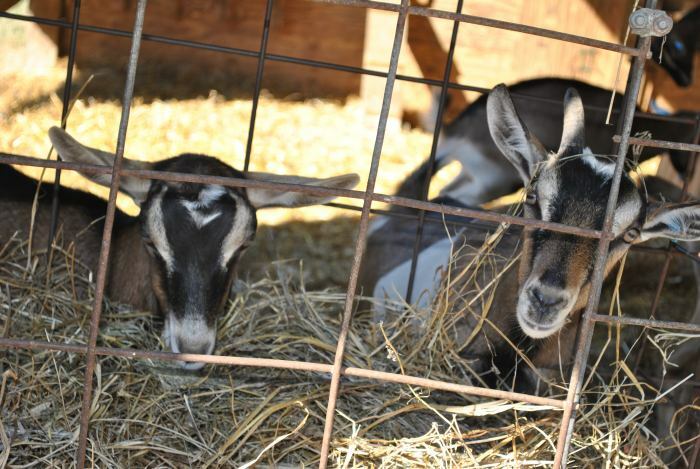 However, I was allowed to take some pictures of the cheeses in the tasting room (which had horrible fluorescent lighting) and of the goats on the farm. 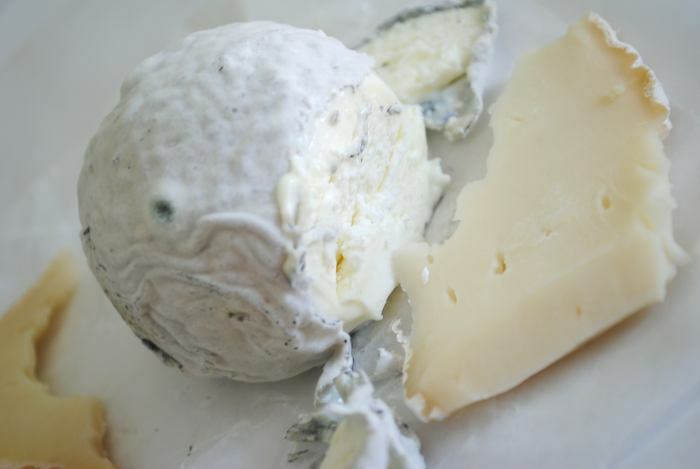 First up is the Wabash Cannonball, a hand formed boulet of creamy surface ripened chevre with an ash layer. Tasted by itself it was darn strong flavored cheese, but I’d really like to try it again when I can get my hands on some fresh figs. 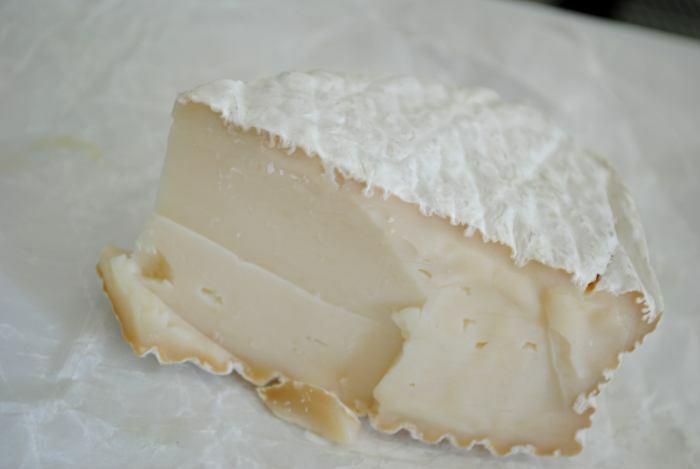 Next up is Mont St. Francis, a pungent aged raw milk cheese. Again, tasted by itself … really strong. One of the suggested pairings was pickles and ESB, which I’m game to try at a later date. Here we have Old Kentucky Tomme, another aged raw milk cheese, which I purchased to take home. In the tasting room it reminded me a little of a young goaty flavored brie. I haven’t got into this one yet, but my plan is to try it with one of the suggested pairings of grilled apples and onions, and possibly the Thunder Hoof Shiraz I picked up at the herb farm. Lastly, O’Bannon, my favorite of them all. 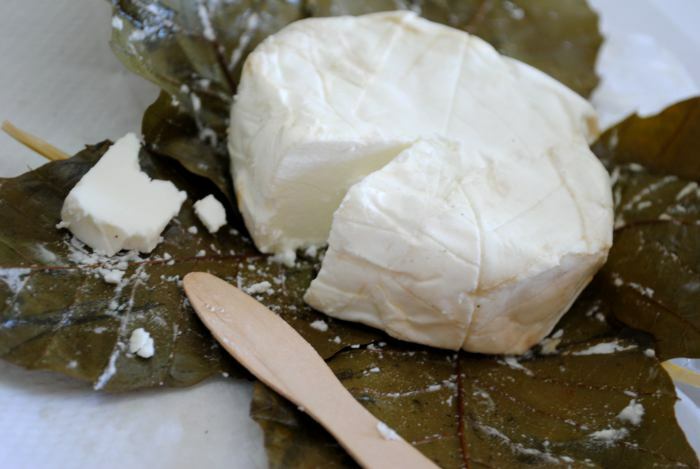 This cheese is wrapped in chestnut leaves soaked in Woodford Reserve Bourbon, and has a wonderful complex fresh, tangy, salty, slightly boozy flavor. Normally, I’m not a bourbon fan – I’m more of an Irish Whiskey kind of gal – but this stuff is fantastic! I took some home with me. I’ve been eating it on toast for breakfast. I love the flavor so much I don’t want anything to compete with it. I plan to ask my sister to bring another one of these up to me the next time she visits. I want to try it grilled in the leaf wrapper served with crostini. I’m salivating just thinking about it! 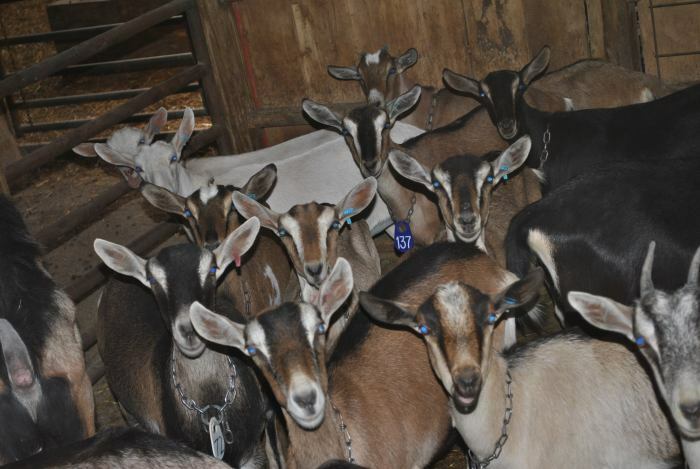 Responsible for these wonderful goat cheeses, is a herd of 500 dairy goats. I was very impressed with the health and care of these animals. Having raised dairy goats myself, as well as making a not-too-shabby chevre, I understand that high quality milk from healthy, well cared for animals is of the utmost importance. The barns were large and spacious, impeccably clean for a space where goats can walk around and poop anywhere they please. These two little girls look about the right size to have been born just this past spring. Despite the huge pastures just outside the barn, the whole herd felt the need to crow inside the barns to watch the three strange ladies with cameras. Typical nosy goat behavior. Part 2 – up to Michigan beer country with my dad and brother-in-law coming as soon as I get it written up. Sometimes, I simply don’t understand my guys! 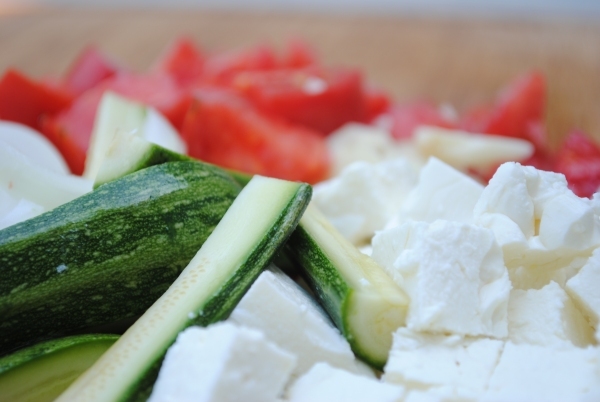 I’ve been cursed with a couple of picky eaters … and a few food allergies to boot. My husband and oldest son are all about meat and potatoes, and it’s difficult to get them to eat their veggies. My husband is allergic to celery, raspberries, cantaloupe, grapefruit, and lemon among other things. My oldest son is allergic to a bunch of fruits and some veggies. My youngest son’s food preferences seem to change on an almost daily basis. One day a meal I fix will be his favorite, and the next day he’s chiding me for forgetting that he doesn’t like it. Will someone explain to me why both my sons like Brussels sprouts, cauliflower, sour kraut, Reuben Sandwiches, and spinach? I’m so confused! Fixing a meal that the entire household agrees upon can be a bit of a challenge, so now you understand one of the reasons I spend so much time experimenting in my kitchen. This soup recipe is the result of some of my tinkering when the boys were small. Sometimes I serve it with BLT sandwiches, but most of the time they just want it with the bacon added directly to the soup. My youngest tells me the soup is awesome, but adding bacon makes is double awesome. Whatever! I’m just glad they like it. A little tip on cooking milk based recipes … to prevent scorching, a large double boiler comes in very handy. I have a commercial grade 1 1/2 gallon stainless steel double boiler that has been worth every single penny I paid for it. If you don’t have a large double boiler, be sure to keep your temperature low and stir frequently. 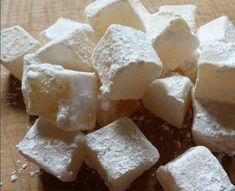 Make a standard white roux by melting the butter in your pot, adding the flour, and cooking for approximately 3 minutes so you won’t taste raw flour. Next, add the milk to the roux and stir with a whisk until thoroughly blended. Seriously… use a whisk, not a spoon. You’ll end up with a smooth, lump free sauce every time. Slowly heat the milk mixture until it thickens. In a regular pot you would need to stir constantly to keep your mixture smooth, and to prevent scorching. The beauty of using a double boiler is that you can actually walk away from the pot for a minute or two. I’m able to work on other kitchen tasks while waiting for my milk to thicken, stopping to stir every couple of minutes. Once the milk has thickened, add shredded cheddar cheese and stir until it has completely melted into the thickened milk. Stir in cauliflower pieces. Add cayenne and salt to taste. 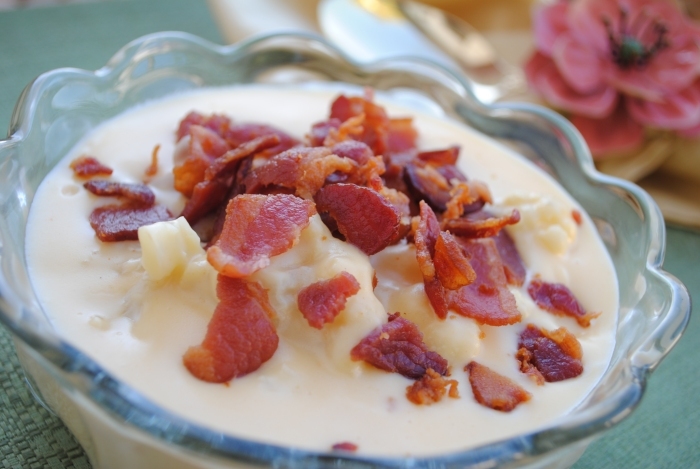 Ladle soup into bowls and serve topped with crumbled bacon.